HOORaay!!! A new year a new beginning. Off with the old and on with the new. Don't look back just look forward. Etc. Etc. Etc. You know all those old sayings, but this year they all seem so much more poignant. Most of us have had some rough times in 2008 and are anxiously waiting to experience the wonders of 2009! I predict a glorious year is dawning!!! I will be counting my blessings as this past year creeps away into the dark night. Come tomorrow morning I will put pen to paper and list my goals for 2009. Some are personal as I continue to be a work in progress. And others are career oriented. Those I will share with you here. At the top of my list of goals is to blog regularly and add photos. I have been shamefully remiss and am rectifying that as of now. Since EVERYONE begins EVERYTHING on Monday I will begin my blog postings on Thursday, Jan. 1, 2009 and pledge to post every Thursday. Please jump into the fray and comment on my ramblings and musings. The more conversation we can generate the more enlightened we all will become. I wish you all the very best life has to offer in 2009. A New Day - A New Beginning 12"x18"
Roseate Spoonbills are beautiful birds. They used to flock in great numbers. Now I am lucky to find a few together feeding among the mangroves. This is a study for a larger commissioned painting. I always paint a study, to scale, so the person who placed the commission can see exactly what I have planned for their painting. It is better to make changes at this point rather than after I have started a large painting. Dance of Morning Light 8"x10"
At the last Wekiva Springs State Park Plein Air Event I painted Dance of Light. I am not a "morning person" but somehow at this event it seems a crime to sleep while all this beauty is blossoming outstide my door. Last night I joined my good friend, Nancy Moskovitz artist extraordinaire (http://www.nancymoskovitz.com/) , at an artists reception for Bobby Goldsboro. Yes, he is the singer, and now a painter. He told me that he had promised himself that he would begin painting all the images he had stored in his head when he turned 65, that was two years ago. He is exhibiting in various places around the state. If you get a chance, do see his work...and of course, all is for sale. Friends of Wekiva Springs hosts a wonderful invitational plein air paint out each year and I have been lucky enought to be invited. The state park and springs offer endless venues to paint from pine tree flats to the beautiful spring itself. 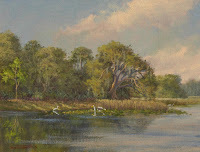 "Still Waters" was painted on the Wekiva River just down from the spring head and can be seen at Thornebrook Gallery. The gallery opening reception was this past Friday. We did not have the turn out we had hoped for, but did enjoy seeing old friends and collectors as well as meeting a few new people. The gallery looked fabulous! David and Trisha did a great job of hanging all the paintings. I took my entire collection (about 30 paintings ranging in size from 8x10 to 30x40) for them to select from, thinking they wouldn't use them all. But, Wow!, they did! The lighting of paintings is crucial and can make or break a show. David has state of the art lighting which allows the viewer to really see the art work. I arrived a bit early and when David flipped on the light switch I was blown away! Even my husband, who is my best critique, was very impressed. I will not be exhibiting in the Gainesville Downtown Out Door Art Festival this year because I was once again juried into the Disney Festival of the Masters which is on the same weekend. So, I do hope you will be able to get by Thornebrook Gallery before my show closes on Sept 27 to see this collection of new paintings. And, by the way, Thornebrook Gallery is not just another art gallery. It is one of the best gift shop/jewelry stores you will ever find. If you are looking for just the right gift (for yourself or anyone else) you must see the many unique items offered at Thornebrook Gallery. I must admit, I found a bracelet I had to have Friday night...and yes, it went home with me. Shangri-La is the last painting I created for the Thornebrook Gallery Exhibition. Us plein air and landscape painters are always on the hunt for new locations and inspiration. I came upon this dream-like path early one afternoon. The graceful live oak trees covered in moss and azalea bushes in full bloom were irresistable. The collection of 26 paintings was delivered this past Monday. It gives me a great sense of accomplishment to complete the work and deliver the paintings on time. And yes, relief when the project is put to bed. The Artists Reception is this Friday evening and as always , is quite daunting. No matter how successful, artists are concerned with how the public will react to their work. I learned this early in my career while studying with the renowned A. E. "Bean" Backus. His work was highly respected and could be purchased only by placing your order in a waiting list, often waiting several years before getting the painting. And yet, with each order and each show, I saw him anguish over whether or not the collector would like the painting. My having been just a beginner at that time, not exhibiting my work, I was puzzled. Now I fully understand. You put your heart and soul into each painting making it difficult to separate yourself from it. Oh well, I have done the work and am proud of the collection so I will go to the reception, pretend I am a princess for one evening and have a great time. I sure hope I will see you there!!! I was inspired by all the rain we have been enjoying lately to paint "Mid Summer Thunderhead". It gets breezy out in the marsh flats with the wind blowing the tall grass and palm frons and whipping up the water just before the rain starts. Birds hunker down and wait for it to pass. Thank goodness for deadlines. If I do not have a drop-dead, this is it, no more time left, the whole collection must be completed by now deadline I would never be finished. Well, today is the day. I must deliver all the paintings to Thornebrook Gallery today. My husband also likes deadlines. He has learned that all (and I mean all) I do the last week before a show deadline is paint. I always need just one more painting! So, we order pizza and chinese food to be delivered, scramble a few eggs, and have the tried and true grilled cheese sandwiches with soup. Of course, no house keeping! But, he is a trooper and has learned that "this too will pass, the sun will shine again tomorrow and all will be right with the world", once the paintings are delivered. We had our big Labor Day party yesterday afternoon. This is an annual event for us with everyone in the neighborhood invited to the pool party. Luckily the predicted 60% rain did not happen. It was a fun day for all. So, today I am back at the computer posting this new painting and then into the studio. "Last Minutes of Splendor" captures that wonderful all over mauve color that makes the clouds and sky blaze just before sundown. What makes these colors pop is the contrast between the reddish-like sky colors with the brilliant greens found in Florida. Giving paintings a title is not always easy. I thought of several different titles for this painting before deciding on Summer Enchantment. Then when I looked at the painting after several days of not seeing it Up, Up and Away struck me as just right. This format is a bit different for me, measuring 32"x16". I had stretched the canvas, painted on the under wash and stacked it on end to the side of my easel while finishing another painting. After seeing it standing there on end for several days the tall slender lines of the canvas begged for this composition. I tried to portray the huge, billowing clouds that hang over the expanse of sawgrass vanishing in the distance. Simple and Uncluttered. As I look at the painting I think maybe Hope would be an even better title. All artists would prefer to be in their studio working full time on their artwork. For most of us, in order to keep creating and selling our work, we must also address the business side of our career. If you would like more information about this seminar please contact Barbara Perroti (bpanartist@earthlink.net) She has done a great job in putting all of this together. The sun has finally returned to north Florida! Hooray!! I have been out photographing my newest paintings and have the first one posted here. You can see these paintings in person at the Thornebrook Gallery Exhibition (http://www.thornebrookgallery.com/) Sept. 13 - 27, 2008. This first painting is appropriately titled "White Egrets". While out scouting painting locations recently I came across this wonderful pond with tons of water birds wading and feeding. For us plein air painters moments like this are magical. I was so enchanted that I have painted a couple versions of this scene and have kept one in my own private collection. Each version is a different size with color variations. My season opening exhibit at Thornebrook Gallery is fast approaching. Luckily for us Tropical Storm Fay dropped a lot of rain without too much wind. So, I have been able to paint non-stop without interruptions. I am very happy with the new paintings and will post them as soon as the sun returns so I can photograph them. David Arrighi, owner of Thornebrook Gallery is planning a wonderful reception September 12. He is sending out over 4,000 invitations, but if you don't happen to get one and want to attend please do. The gallery is located at 2441-6D NW 43 St. Gainesville. You may call the gallery at 352-378-4947 for more information. August is here already! Where has the summer gone? I was going to get so much done. But, alas, I still have so much to do. I am pleased to announce that my painting "A Moment to Reflect" has found a wonderful new home with Greg and Beth. They had commissioned a painting that happened to be just what I wanted to paint at that time. So all the "creative juices" were flowing and it went together rather quickly. Painting is so much fun when that happens. Wow! My dear friend Linda Blondheim gets a big THANK YOU for honoring me with the Arte Y Pico Award. This award was created to be given to bloggers who inspire others with their creativity, and for contributing to the blogging world in whatever medium. Here is the finished painting after tweaking and adding a few birds. It looks pretty much the same as the previous posting because you can't see the subtle color enhancement and brush strokes. I have titled it "A Moment to Reflect". I was surprised to get an email from the people who have commissioned this painting. They visited my blog and wrote to ask if it is their painting and if so, they are delighted and can't wait to see it finished. Commissions are a bit more stressful than painting for myself because I want it to be just what the customer ordered. I am pleased to know they are already happy with it. This is a commissioned painting similar to "Southern Skies" (posted Feb. 8). I say similar because I never paint an exact replica of a previous painting. Not only is that impossible but also boring. Part of the challenge is to use like content (trees, water, grass, etc) and design a whole new look. This painting includes all the elements of "Southern Skies" without being a carbon copy. I still have a bit of work to do. Some tweaking of the accents and of course, adding birds to give it life. This afternoon Florida Department of Cultural Affairs hosted a teleconference "Connecting with Technology" with David Rowell (http://www.theatre.fsu.edu/) and Jeri Goldstein (http://www.performingbiz.com/). The topics they covered were: Target Your Audiences, Maximize Your Email Campaigns, Optimize Your Web Site, Write Focused, Audience Specific Copy, Use Social Marketing to Build Audiences and Drive Traffic to Your Main Site and Blog Effectively. This was the second conference I have attended put on by this department and they both have been outstanding AND Free! I highly recommend that everyone go to http://www.florida-arts.org/ and register to receive quarterly notices for everything from these types of conferences to calls to artists. So easy!!! I painted the "Florida Cracker House" during the Heart of Florida Plein Air Paint Out this past April. This is a pioneer home just down the street from the Wood and Swink Post Office and Country Store in Evinston. If you havn't visited there you should. Evinston is just north of MacIntosh off Hwy 441. My show schedule is beginning to fill up already. As I mentioned previously, my solo exhibit at Thornebrook Gallery in Gainesville will run September 5 -20. I stopped by the gallery yesterday to drop off two paintings that had been purchased by collectors who live in the area. Gallery owner, David Arrighi, allows me to leave paintings with him, making it easier for those in the area to pick them up there, instead of traveling to Ocala. I took this opportunity to discuss the upcoming show, refresh my memory about the space and have a better idea about how many and what sized paintings I will need. October brings three juried Festivals I have applied for: Thornebrook Mall-Oct. 4-5, Winter Park Oct. 11-12 and Ocala Oct. 25-26. Also, if I can split myself in two there is the Invitational Crescent Beach Plein Air Event Oct. 21-25. Disney Festival of the Masters is November 7-9. And I just received a call yesterday from the A.E. Backus Gallery in Ft. Pierce inviting me to exhibit November 25 - Jan. 3, 2009. In addition to building my collection for these shows I have several commissions I need to finish. As you see, the work never ends. Remember the old saying "a person never works a day in their life if they are doing something they love". Wow! I sure am lucky!!! 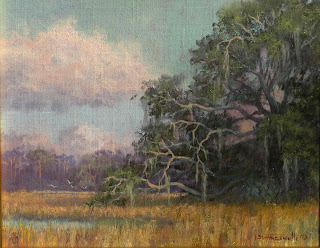 The Heart of Florida Plein Air Paint Out was outstanding. I highly recommend this event as THE one to see. The quality of art produced during the event is some of the best plein air paintings out there...and to actually WATCH the artists create these master pieces is extraordinary. If you would like to know about the next one email me. My painting Classic Florida was done during the paint out. The Elliot Museum exhibit was also first class. The OUT OF HAND ARTISTS SALON had been invited to exhibit as a group. 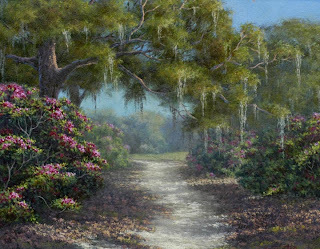 The art ranged from my Florida landscapes painted in oil, to equine paintings by Sharon Crute and Moe Hahn, portraits by Merrill Andersen, and landscapes and still life paintings by Nancy Moskovitz and Mary Verrandeaux. If you did not get a chance to see this show let me know, when we have another group show I will send you the Where and When. For those of you on the east side of Florida and those who might like to visit, the Elliot Museum is an extension of the Historical Society of Martin County. They have an extensive collection of items recording the history of the area. While there, take a few minutes and visit the House of Refuge Museum located right on the ocean. This is a great place to learn about some of Florida's history. LeMoyne Museum of Art sponsors the "Chain of Parks Fine Art Festival". This is a wonderful show in a charming setting in the heart of Tallahassee. My husband went ahead of me on Friday to set things up because I had to attend the Heart of Florida reception Friday night. I was up very early Saturday morning and on my way, getting to the show before it opened at 9 AM. It was well worth the effort when I was presented with an Award of Merit at the artists dinner Saturday night. Wow! Winning an award sure is fun! Wednesday, April 23 found me on the road again. This time I was headed for Ft. Pierce to participate in their first "Souvenirs of Downtown Plein Air Invitational Event". RL Davenport, owner of Brush Strokes Gallery & Framing, and Pam Gillette of Main Street Ft. Pierce, Inc. were Co-Chairs for the event. A portion of the sales went to benefit the Platts/Backus House Renovations and Main Street Fort Pierce, Inc. The weather was great and lots of people came out to see the artists at work and to purchase paintings. So ends April. As you see this was an extremely busy month for me, but so much fun! Thank goodness things have quieted down as far as shows go. The Florida Department of State, Division of Cultural Affairs, offers many opportunities to artists from exhibits to workshops. Go on line (http://www.florida-arts.org/) and sign up for their notices. I applied for (by sending my portfolio) and was selected to participate in a workshop in Tequesta May 3. Yep, back in the car AGAIN. This was an all day workshop aimed at promoting our art work or "Doing the BUSINESS of your art". I made some great new friends and contacts in addition to learning lots. May also found me in THE VILLAGES as the invited Judge for an art show there. All the art was well done making picking winners difficult. Congratulations to those who did win a ribbon and a hearty "pat on the back" for everyone who participated. It is hard to put your art out there for all to see, but exhibiting is a great chance for growth. May brought a couple of graduations in my family. My older son, Chad, graduated from college with his Bachelors Degree in Business Management and his daughter, Damie (my only granddaughter) graduated from 4 Year Pre School, replete with cap and gown. Needless to say I am very proud of both of them. 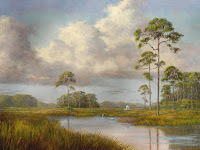 My painting "Southern Skies" was juried into the Museum of Fine Art Bienniel in Deland. The Artists Reception was Friday, June 6. This is definitely a show to see. It fills two galleries, one downstairs and one upstairs. If you go, my painting hangs on the wall behind the reception desk in the downstairs gallery. Well, that catches us up to the present. The summer is my major painting time to build my collection for the coming season starting in September. As I finish new paintings I will post some for you to preview. I still invite people to visit my studio in Ocala to see paintings and make purchases. The Gainesville gallery just makes it more convenient for those of you in that area to see my new work. I am up early because I have a lot to do today. My granddaughter is having her 5th birthday party at my home tomorrow because we have a large swimming pool with divingboard, slide and waterfall. So, since my husband is away (remember the bowling tournament in Albequerque?) I need to get the grass cut (we have about 1 acre). Then I will help my daughter-in-law clean up the pool deck (from yesterday's swimming) and screened porch, check out the bar-b-q grill, and make sure the bathrooms are presentable. All of this before 2 this afternoon. I have to be on the road by 3PM heading for Deland. The Museum of Florida Art Bienniel Artists Reception is this evening from 5PM-7PM. My painting Southern Skies was juried into the show! April was one of my very busiest months starting off with the Sante Fe Community College Spring Arts Festival. This is usually a great show with good weather, but we had rain on and off all weekend with the show closing mid-afternoon on Sunday. I had a couple of days to recover before the Heart of Florida Plein Air Invitational Event began on the following Friday (April 11-18). Annie Pais and Stewart Thomas once again put on an outstanding event; hundreds of people came out to watch the artists and BUY paintings, enjoyed hay rides to the various locations on private farms and ate great, locally prepared southern cooking in the Evinston Town Park next to the Wood and Swink Post Office and Store. Go to my web site to see a few of my paintings I created during the week. If you can't pick them out email me and I will tell you which ones they are and where they were painted. I was invited to exhibit at the Elliott Museum in Stuart. Because I was at the paint out another artist in the show - fabulous equine artist Sharon Crute - delivered my paintings to the museum for me along with her own work. As luck would have it, the Museum Artist Reception was Friday night (April 18) in addition to the Heart of Florida Artist Reception the same night and time in Gainesville at the Thomas Center. I could not be in two places at once so, I opted to attend the paint out reception. I had to be in Tallahassee early Saturday morning for the Under the Oaks Art Festival and it was closer to travel from Gainesville than Stuart. There is lots more to tell, but the lawn mower is calling me. I will continue the saga on Sunday and add in a few photos. Today is my birthday! I won't tell you the exact number but just admit to over 50 and that I qualify for the Senior Discount many places. I have had a delightful day. Both of my adult sons called and sang Happy Birthday to me (tradition in our family). My husband called from Albuquerque (on a bowling tournament jaunt) and sang, but more importantly told me where to find my gift! My wonderful daughter-in-law came over with the grandchildren and we all swam in the pool. Now I am getting ready for them to pick me up and take me to dinner! Things could not be more perfect. I will be back here tomorrow to fill you in on last April's shows. Wow, I can't believe it has been so long since I last published an entry! March 1-2, I was in Ft. Pierce for the A. E. Backus Fine Art Festival. Because Beanie Backus was my friend and mentor for many years I always participate in everything that honors his memory and outstanding work. 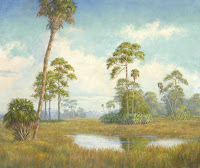 Monday, March 3, I headed to Apopka for the week long Wekiva State Park Invitational Plein Air Event. I had a great time painting and visiting with many artist friends I had not seen in a while. Linda Blondheim, Elizabeth Ferber and I shared a cabin which quickly became the place to be each evening after it became to dark to paint. And of course, Larry Moore suggested s'mores around the roaring campfire, so off went Peter Carolyn to get all the necessary supplies. We all gained about 10 pounds each that night. Here are two of the paintings I did that week. 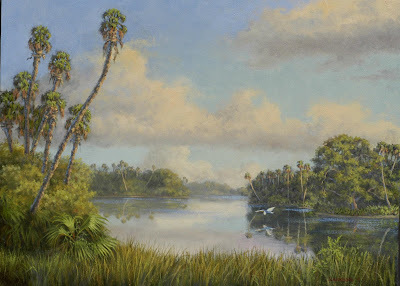 I could not stay the entire week at Wekiva because Thursday March 6, I headed to Vero Beach for the three day Under the Oaks Fine Art Festival, March 7-9. Then back down to Ft. Pierce March 28 to attend the artists reception at the Backus Gallery. My very good friend Susan Cassens was exhibiting her work for the first time! I HAD to be there!!! Tomorrow I will fill you in on my April schedule: two more festival shows, two paint outs and a museum exhibit. I have only 10 (ten) more days to paint before my world gets really crazy. I tend to overbook, like airline companies. I leave home February 28 for the A.E. Backus Fine Art Festival in Ft. Pierce and do not return home until March 10. The Backus show is March 1 & 2. 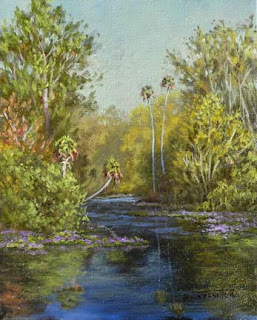 On Monday March 3 I head to Apopka for the Wekiwa Invitational Plein Air Paint Out Event. This is a fabulous week of painting with some of the best plein air painters in a magnificent setting. How could I refuse the invitation? Then I leave Thursday, March 6 for the Vero Beach Fine Art Festival March 7,8,9. Thank goodness for my husband, Harry. While I am out having fun painting at Wekiwa he will travel back and forth from our home to each of the shows. Since I must be present I will arrive in time for the opening and leave at the close of the shows. He will do all the setting up of my booth and break down. It would be very tough to do this without him. Well, I am off to the easel! I have discovered how to make the painting images large enough for you to see. So, I posted this again. I recently posted images of this painting as it developed from my pencil sketch on paper. The various stages show how I usually work...remember, paintings never progress exactly the same way. Basically, I lay the clouds in first and then the sky color, completing that portion of the painting down to the horizon. Land masses are layed in next in value progression (lighter and greyer at the horizon-richer, bold color in foreground) from the horizon forward. Then the real fun begins with color and brush work to finish the painting. While living in Ft. Pierce I spent many hours on the St. Lucie River. This was a commission I greatly enjoyed doing, bringing back lots of fond memories. And then the bonus for me was when J. and Marcie Gaines, who commissioned the work, previewed the painting and were thrilled saying, "Wow, it is beautiful! We love it!" Another painting is underway. I have completed the pencil sketch and am painting a very small (to scale) color sketch for Bruce and Bridgette Abernethy to approve before I begin their large painting. Check back with me. I hope to have the color sketch posted here in the next day or two. My husband, Harry, and I headed to Mount Dora Friday afternoon to set up for the weekend show. It was cloudy and a bit windy. We were prepared for rain and cold having learned over the years you never know what will happen with the weather. When I first participated in this show years ago we drove back home to Ocala each night which is a 1+ hour drive. This made for VERY early rising in order to be set up on time in the mornings. That got old so for the next few years we stayed in a hotel in Mount Dora. This was fine, but we still had to get to the show early each morning in order to get a parking space close to our booth. Last year we treated ourselves and stayed at the historic Lake View Inn, which is pricy for a working weekend, but nice because we were able to park our van close to my booth space and leave it there the whole weekend. Last year we discovered a delightful Bed and Breakfast right on the main street and made a reservation. It turned out to be just around the corner from my booth and we parked the van just a few feet away. This working weekend turned into a mini vacation. We had an adorable room on the second floor with bath, sitting room with a dinning table that overlooked the art show and full kitchen. It was convenient to return to the room during the day to take a break and get a snack out of the refrigerator. Friday and Saturday nights we strolled around town and had dinner with friends. Yes, we already have our reservation for next year! Saturday dawned bright, clear and sunny! I do not remember such glorious weather for the Mount Dora Show in years. After all the gloomy days we have been experiencing it seemed as if the whole world rejoiced in being outside and turned out in huge numbers. The streets were packed both days. I had decent sales of smaller items Saturday. Sunday was my biggest sales day with several original paintings finding homes along with several framed giclee prints. There is the possibility of a couple of commissions for people who want a specific size painting and one who wants a particular spot depicted in the painting. There was a charming young man from Indianapolis in the booth next to me. He is just beginning his art career with all the enthusiasm of youth. Please check out his web site (www.supershwa.com) I believe he is an up and commer and someone whose art you need to add to your collection now, before it gets too expensive! By the way, his name is Josh Rush. Look him up at the Melbourne show coming in a couple of weeks, and tell him I said HI! I also had the good fortune to have my booth just across the aisle from friend, Out of Hand Artists Salon associate, and super artist Mary Verrandeaux. She went to Ringling School of Art and has been in the field for a while but like Josh, is fairly new to the art show world. 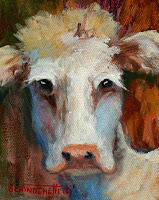 Her web site is www.mverrandeaux.com Mary's work is bold and will brighten up any wall. Don't miss the opportunity to include her paintings in your collection before her prices go through the roof. And guess what! I had a painting selected by two of the three judges for award consideration. I did not receive a final award, but like they say at the Oscars, "It was nice to be nominated". All in all, this was a really great show and a pleasure to be in Florida. The Florida Regional Art in Focus Exhibit has closed. A great number of people viewed the art during the two weeks the collection was displayed at the Lake Eustis Institute. 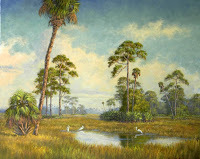 The staff reported glowing comments from the visitors praising the high quality of art work illustrating the diversity of the Florida landscape. The exhibit ended with a catered dinner at Lake Receptions, in Mount Dora. David Glynn of Turkey Creek Auctions conducted the sale Friday night at the Black Tie & Blue Jeans Gala and Art Auction. The event was well attended with all enjoying an evening of fine dining . This group of artists was hand picked for their high level of expertise with reserve prices reflecting their standing as top professionals in the art world. The artist received 80% of the sale and 20% went to the Institute, a non-profit organization. Alas, as so often happens with fund raising auctions of art there were few sales. People must have a vested interest in the artist, the specific painting, and/or a major interest in the "cause" the event is raising funds for in order to justify spending a large sum of money. Yes, they get a tax deduction, but that is not always the big incentive to buy art at one of these auctions. The Lake Eustis Institute staff did a fine job of promoting and advertising this event. Each phase of the project was executed splendidly. So, what happened? The old saying is true "You can lead a horse to water but you can't make him drink". Having said that, if the horse has reasoning power you can explain to him how drinking will benefit him, giving him necessary information so he can make a wise choice. The more information a person has the greater chance there will be a sale. Otherwise, it is like buying the Mystery Prize at a carnival---there are things in the brown paper bag but I don't know what is inside, if I will like it or if it is worth the amount of money I am paying for it? If promoters of art auction fund raisers would put as much time and money into educating bidders about their cause (what the money will be spent on and why they should give support), the artists, and the art itself as they do on advertising and selling tickets to the event I am confident these auctions could be very successful. Again, the staff at the Lake Eustis Institute did an outstanding job on this first event. All participants, both artists and those who attended, had a great time. I am sure the next fund raiser will be even better and more profitable. Saturday and Sunday, February 2 and 3, is the Mount Dora Fine Art Festival. This is an outstanding show that draws artists for across the nation. If you want to see great art this is the place to be. I will be exhibiting my collection of new oil paintings, including the large 30"x40" painting posted here recently. This will also be an art festival debut for the smaller, canvas wrapped paintings I have been experimenting with. Treat yourself to a fun weekend! Stop by my booth (I would give you the number but it isn't assigned until the day of the show), I would enjoy meeting you. She is a wonderful equine artist and very knowledgeable about the industry. I recommend you check out her web site and blog. You will be delighted with oil paintings. It thought this was pretty cool. Thanks, Sharon Crute (fabulous equine artist), for finding this. Wow! I worked really hard to lay this demo out, but it sure did get messed up when it got published. The preview looked great with the pictures and text appropriately spaced. Sorry about how it got jumbled up in the final published format. Just a few more bugs I have to learn about and work out. Thanks for bearing with me. The St. Lucie River meanders through St. Lucie County on Florida's east coast. I spent many hours on the river during the 18 years I lived in Ft. Pierce. The best time of day was late afternoon/early evening when the sun was low in the sky. Egrets and Herons fly in to roost in the trees as the soft, fading light cast a warm pink and then golden wash over everything. 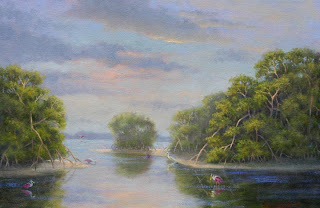 I have been commissioned to creat another painting of the St. Lucie River. As the painting progresses I decided to photograph it and post it here so you can see how it developes. This is the beginning lay-in. I applied a light wash of yellow ochre in acrylic paint first. Then I transfered my pencil sketch onto the canvas in Ultramarine Blue oil paint thinned with turpentine. The sky is layed in before anything else. Cloud color first then the sky color surrounds the clouds with the paint eating into the cloud paint to give soft edges. I now work back to front, or from the horizon forward. Values are of prime importance at this point. The fartherest trees will be lighter and greyer with the trees getting darker as they advance to the foreground. When I feel my values are correct I begin building the color. I can alter minor things at this point, but the composition is pretty well set. Stay tuned to see the final stages of development. While out painting in a cow pasture this cute calf kept hanging around. I just had to paint a quick study of her. That translated into a mini (5"x4") painting with wrap around sides. She was a lot of fun to create. I enjoyed the loose brush work and trying to capture the quizzical look on her face. She did not sell at the Holiday Mini Show and is available ($60.00 with table stand). This is a perfect example of taking advantage of everything around you when you are painting en plein air. You must be observant. Think out of the box. There is more to see and paint if you take the time. After taking time off during the holidays I was really anxious to get back into the studio. I had done some work in the field and had fresh studies to work from for this painting. As a result, the painting went quickly, only taking a few days. It is amazing what you can do when all the creative juices are flowing. My show schedule is now posted here. If you would like more information about any of the shows please go to my web site. If you need additional information you may post a comment here or email me from the web site. If you attend any of the shows, please say Hi, I would enjoy meeting you. I am working on my blog, trying to spruce it up a bit. How do you like this new color format? Post a comment and let me know. I hope to add some links to other artists I highly respect, so you can go to their web sites. When I get word of sales to purchase art supplies and frames I will include that info. It is always nice to save a little money now and then. As I am building this blog and adding to it please send me a comment about what you would be interested in hearing about. Last night was the Opening Reception for the Florida Regional Art in Focus Exhibit. It was a lovely evening with delicious hors d' oeuvres and wine. All who attended were treated to a superior collection of wonderful Florida art created by some of Florida's top artists, a group in which I was honored to be included. Neil Adamson, John Costin, Susan Dauphinee, Doug Hays, Keith Martin Johns, Diane Pierce. Jim Fitch was not able to attend, which was disappointing for everyone, he is such a wealth of information. We were pleased that he did send a written form of his presentation for all to read and talk about that evening. Which made for lively conversation and in-put from the collectors present as well as each of the artists. There is much more I can add but do not have the time right now. My husband, Harry, and I are off the the Florida basketball game! We are avid fans.